The UK DVD of this movie is uncut, but contains the uncut international Export Version instead of the Director's Cut. However, the Director's Cut scenes are available in the bonus section of the DVD. More recent issues contain both the Director's Cut scenes and even another new scene. Comparison between the uncut Director's Cut and the uncut international version taken from the UK DVD (BBFC 18). Running time designations refer to the UK DVD. 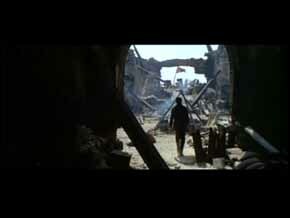 Sentenza enters a destroyed Confederate fort and the local field hospital. 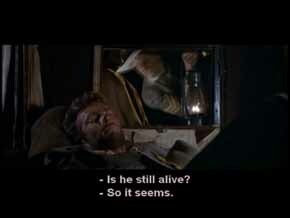 He asks a soldier for Colonel Bill Carson. At first, the soldier does not want to say anything, but a bottle of alcohol can convince him to talk. Carson hast moved on towards the desert. If he was not dead he would probably be in the POW camp of the Yankees in Betterville. Tuco drags the half dead Blondie through the desert. 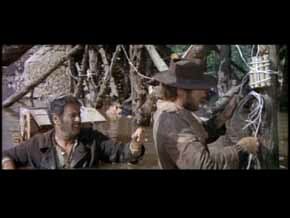 Blondie tries to grab Tuco's boot, but it is empty because Tuco is cleaning his feet in a bucket of water. Blondie crawls towards the bucket and wants to drink, but Tuco spills it and laughs. Afterwards, he eats something before they go on. 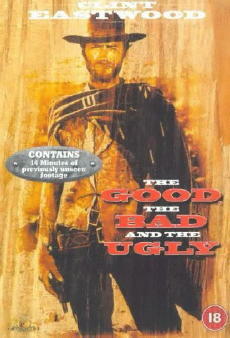 Tuco wants to save the half dead Blondie, at night he arrives at a road blockade of the confederates. He shows Colonel Carson's papers and the guard tells him to bring the sick Blondie to the mission nearby. Blondie, healthy again, and Tuco have a look at the map to see where they are when they find corpses and graves of soldiers. 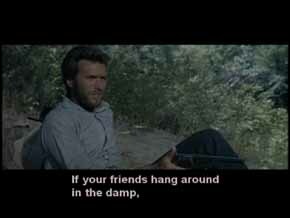 He wonders where they might be now and then asks Tuco where they would go. However, he does not get a proper answer. It is morning, Blondie and Sentenza sleep. Suddenly there is a sound coming from the shrubbery. Blondie draws his Colt and shoots the man who is hiding there. Sentenza calls and more men appear, companions of the first one. Blondie says that 6 men are exactly the right amount because that is how many bullets his gun holds. 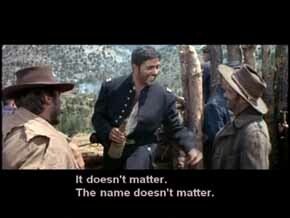 The Drunk Captain leads Tuco and Blondie through a trench and explains the situation. He also states that drunkenness was a source of motivation for his soldiers and that the smell of alcohol was the only thing both sides had in common.He asks them for their names but does not receive an answer. 1. 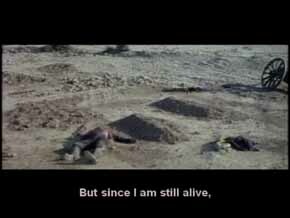 The drunk Captain was hit and is lying on a table surrounded by soldiers and a medic (still included on the DVD). The medic presses a cloth on the wound, the Captain cringes. 2. Fade over. 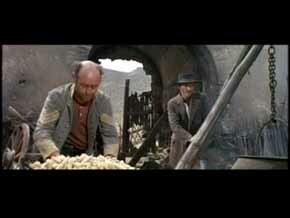 Blondie and Tuco apply explosives to the bridge pillars. A part of this is exclusive to the Director's Cut.